Welcome to Miss Alldread's class, we are Year 3A, The Tiger Tribe. Homework books will be sent home every Friday and need to be returned by the following Wednesday. Children will be tested on spellings every Monday when a new spelling list will be glued into the spelling book ready for the following week. By the end of Year 3, children need to know they 10, 5, 2, 3, 4 and 6 times tables. Each week your child will be given a times table to learn. These will be tested on Friday. Children have been given their log in details to access the Times Tables Rockstars website which is a fantastic way for children to work on learning their times tables at home. On Friday 11th May we were very pleased to welcome our local MP Lee Rowley to our class. A few weeks ago, when we were learning about oceans we wrote to him to tell him about the dangers sea horses are facing in the wild. In response, Mr Rowley wrote each child a letter and then came to hand deliver them to the children. The children then had time to ask him questions. 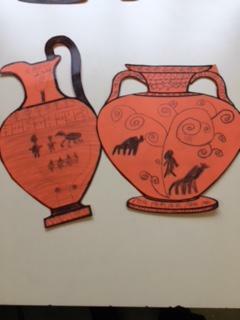 In our new topic, the children will be finding out about the ancient Greeks and answering the question 'What did the Greeks Do For Us? We are looking forward to learning lots of new things in our topic lessons in the next few weeks. 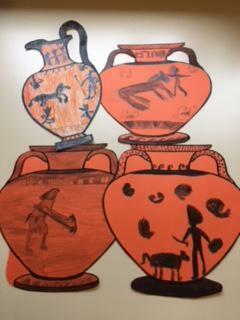 The children have already drawn some beautiful Greek vases. What's The Commotion in the Ocean? 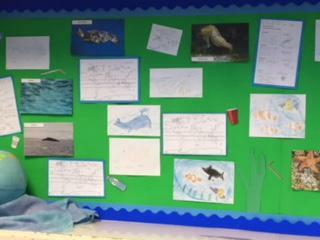 The children loved learning about oceans, ocean animals and the problem of pollution in the oceans. They produced some beautiful work that we were all very proud of!